Midway offers the same high quality tool steel used in our rotary dies for flat die configurations. 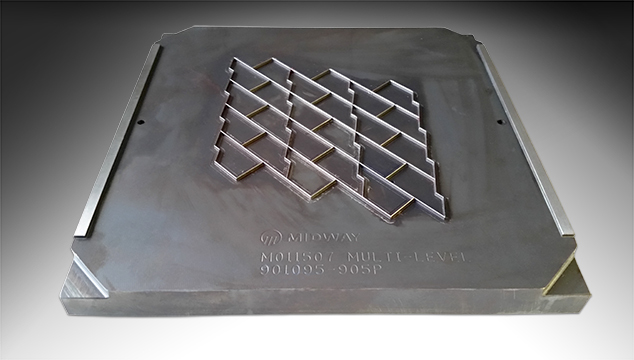 For applications requiring the accuracy of engraved tooling and the durability of tool steel, Midway will manufacture flat dies for a large range of presses. Flat die tooling from Midway can incorporate all of the advantages of ejection, deep routing, multi-level cutting, "invisible" perforation, and any other requirement that is needed to perform the job. Used in reciprocating presses for high accuracy special shapes requiring extended production, Midway flat tooling is an exceptional value.